Another year passes, where did it go? Without the use of my iCal, I’d find it very difficult to easily review my year and get a feel for exactly what took place. As I looked at my iCal today and looked back over 2014 it’s been an amazing year. New customers, existing customers and meetings with potential customers. All of this activity is underpinned by the constantly changing and dynamic environment of digital marketing. I Love it! Each conversation is generally about a journey, about taking someone from point A to point B and to gain insight about that person along the way while offering value at each stage. 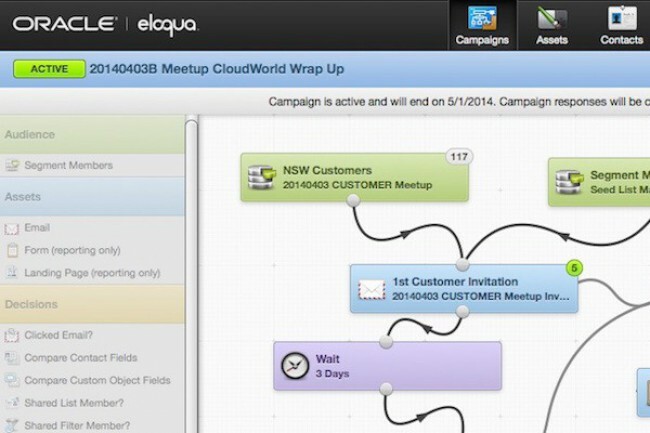 2014 has seen a range of excellent enhancements to the Oracle Marketing Cloud to help support that journey. The Cloud brings many benefits, the one I think ranks amongst the highest is the frequency of enhancements to Cloud based platforms. Oracle Marketing Cloud deliver updates to the platform at least three times a year. 2014 has seen some fundamental enhancements. This feature enables Modern Marketers to quickly and easily send a single email to a single segment of contacts. This feature was added largely based on user feedback. While the Oracle Marketing Cloud Campaign Canvas is an amazing tool for multi-step campaigns, the Simple Email Campaign feature is quick and easy to execute and provides immediate reporting directly from the campaign without the need to access Insight reporting. Generally the domain of the B2C marketer, A/B Testing is now also available to the Oracle Marketing Cloud B2B marketer. It’s executed using a Simple Email campaign. It automatically chooses the winning email and then sends the winning email to the remaining part of your segment. You have a sliding scale to determine the number of people within the testing phase. It’s easy and truly automated. Oracle has literally spend billions of dollars acquiring platforms to fill out the Oracle Marketing Cloud. This started with Eloqua in December of 2012. From there the shopping spree has continued with Vitrue, Collective Intellect, Involver, Responsys, Compendium, BlueKai and in December 2014, Datalogix. What does this mean for Oracle Marketing Cloud users? It adds a huge range of functionality to help you build out your digital marketing campaigns. It’s about reaching various audiences – B2B, B2P or B2C, it’s about advertising, it’s about measured and accurate presentation of information to buyers at the right time with the right content. This feature will vary in excitement for Oracle Marketing Cloud users. For some there’s little value today, but for others it will be fundamental. Essentially, today a contact’s email address is the Unique Identifier for contacts. This is sometimes a problem where multiple contacts will provide the same email address for marketing purposes. e.g. multiple people in one company will provide info@acme.com.au as an email address. This change to Oracle Marketing Cloud will enable you to, for example, take the CRM Unique ID and bring that across to Oracle Marketing Cloud as the unique identifier. The Market Place is not just about Apps, it’s also about Oracle Certified Partners who can help you get the most out of Oracle Marketing Cloud, Oracle Sales Cloud and Oracle Service Cloud. There are over 80+ apps for Oracle Marketing Cloud, it’s certainly worth a look to see how to you extend your campaigns with third party applications e.g. WebEx, GoToWebinar, Message Media SMS, Avaya Call Centre, SnapApp and more. It’s new years eve and while I’m sitting here at my local cafe penning my thoughts, it’s not possible to list all of the enhancements this year. You can visit the Oracle Marketing Cloud Topliners Release Resource Centre to read in detail what’s been delivered in 2014 and what’s coming for 2015. Have a great new years eve. I’ll see you in 2015.